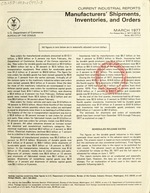 U.S. Department of Commerce For Release May 2, 1977 2:00 P.M.
now $0.4 billion or 24 percent above February. as equal to shipments since there is no backlog of unfilled orders. due to a decline in the radio and television industry. billion or 14 percent, mostly due to motor vehicles and parts. rose $0.1 billion or 5 percent. goods rose $7.9 billion or 5 perc 153.8 billion. $0.6 billion or 1 percent to $61.5 billion. 1977 as explained on page 7.
scheduled for release on June 1, 1977. Mar. Feb. Jan. Mar. Feb. Mar. Feb. Jan. Mar. Feb. Dec.
Machinery, -. -r-L, I 1 r rI .1. See footnotes at end of tabl. - Represents zero. Preliminary. rRevised. Mar. Feb. Jan. Mar. Feb. Annual Mar. Feb. Jan. Mar. Feb. Dec.
appli ianc-,s; ophthalmic go..ds, watches, and clocks, watchcases; and miscellaneous personal goods. Capital go..ods industries i'h1- capital goods industries series is comparable to the previous Producers Capltl I oods and t t It .-nn. Mar. Feb. Jan. Mar. Feb. Dec. Mar. Feb. Jan. Mar. Feb. Dec.
Duri able gofids industries, total .................... ..
PPreliminary. rRevised. 'X Not applicable. products; and rubber and plastics products, n.e.c.